Our lab is currently studying the systematics and biogeography of chalcidoid wasps in the genus Cales. 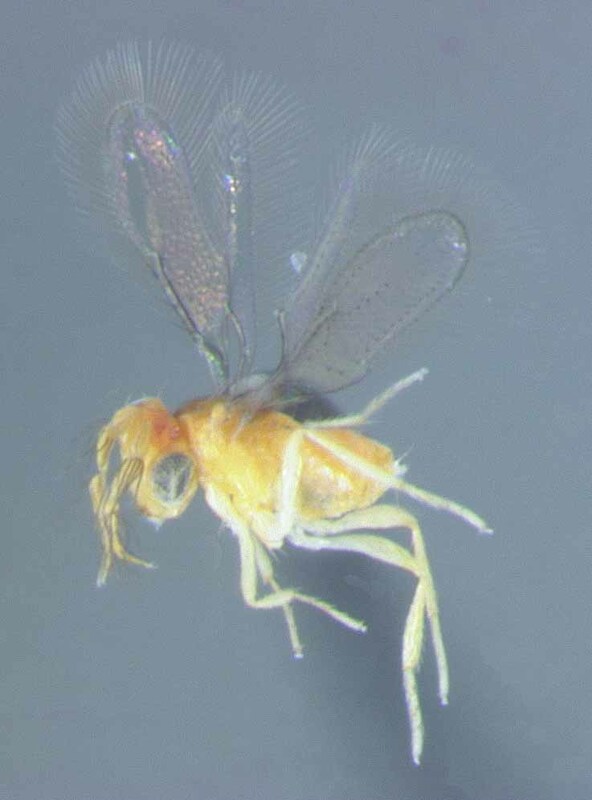 Of particular interest is the species Cales noacki Howard, (Figure 1) which is an important biological control agent of the citrus woolly whitefly, Aleurothrixus floccosus (Maskell), which is a serious pest of citrus trees worldwide. Like other whiteflies, these insects cause direct damage to leaves by sucking phloem sap and producing honeydew, which facilitate the growth of black sooty mold. Ants are attracted to honeydew and may interfere with natural control of whiteflies and other hemipteran pests. Initial efforts to eradicate woolly whitefly using chemical insecticides were unsuccessful due to the rapid spread of the whitefly following its discovery in California in 1966 (Robinson 1969, DeBach and Rose 1976). Consequently, management efforts have focused on biological control of woolly whitefly in countries where it has become a pest. 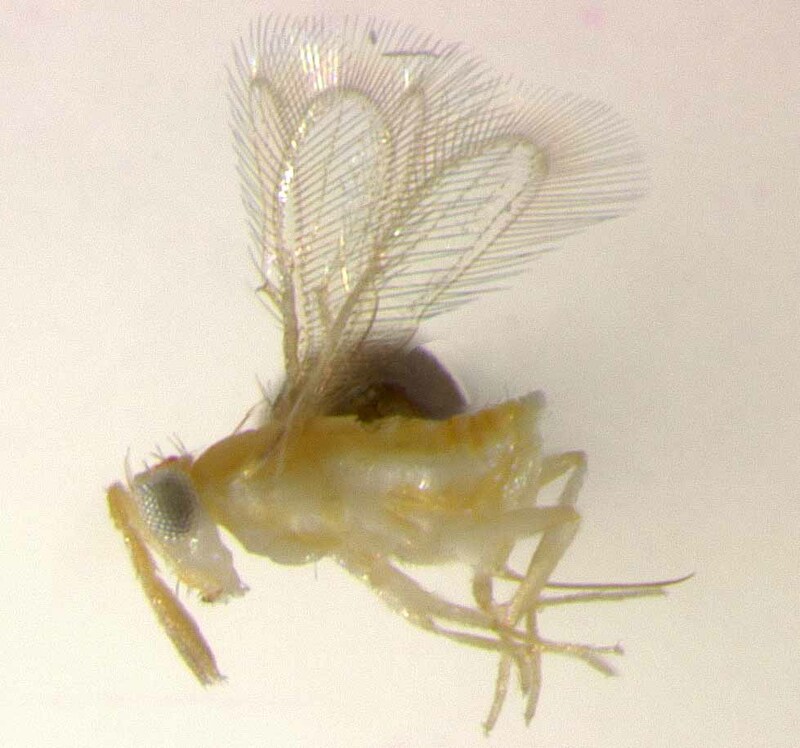 Despite the suppressive effects of C. noacki and other parasitoids, woolly whitefly continues to be a sporadic but significant pest of California citrus. Recent infestations in residential areas of Bakersfield (Kern county) are spreading, and parasitic wasps known to control woolly whitefly in other parts of the state are absent in these areas. Furthermore, resurgence of woolly whitefly following the abatement of chemical insecticide applications targeting glassy winged sharpshooter is a distinct possibility. Much work remains to be done on the systematics of the genus Cales (and the subfamily Calesinae). There is no consensus regarding placement of this subfamily, although is has been included in Trichogrammatidae, Mymaridae, and most often Aphelinidae (De Santis 1948, Yasnosh 1976, Hayat 1983, Hayat 1994). Currently, it is not included in any family (Hayat 1994). The sole genus contains three described species (Viggiani and Carver 1988). An undescribed fourth species has been reared in New Zealand from whiteflies in the genus Asterochiton (Aleyrodidae). Recent DNA sequence analyses of C. noacki suggest that at least three distinct genetic variants coexist in the biocontrol citrus grove at the University of California, Riverside (J. Heraty, unpublished data). The first variant (males and females; Cales noacki A on figure 2) is known only from the biological control grove at UC Riverside. The second variant (based on two males; Cales noacki B on figure 2) differs by only a single nucleotide from the first variant. The third variant (males and females) matches collections from Italy (populations established from exports in the early 1970s; Cales noacki C on figure 2) and also from redbanded whitefly on Avocado at the UC South Coast Research and Extension Center (collected by Mark Hoddle). This variant has enough nucleotide differences for both nuclear ribosomal DNA (28S) and mitochondrial cytochrome oxidase (COI) to be considered as not just another reproductively isolated species, but as compared to other Chalcidoidea, possibly another genus! Thus far we have identified no morphological differences that can separate any of the variants. While we can infer that these are at least two cryptic species, we know nothing of differences in their biology that may have an impact on their importance for ongoing biological control efforts. We hope to further explore this issue by continuing to assess the diversity, biology, and biogeography of the C. noacki cryptic species complex. DeBach, P. and M. Rose. 1976. Biological control of woolly whitefly. Cal. Agriculture 30: 4-7. De Santis, L. 1948. Estudio monografico de los afelinidos de la Republica Argentina (Hymenoptera, Chalcidoidea). Revta Mus. La Plata, Zoologia 5: 23-280. Hayat, M. 1983. The genera of Aphelinidae (Hymenoptera) of the world. Syst. Ent. 8: 63-102. Hayat, M. 1994. Notes on some genera of the Aphelinidae (Hymenoptera: Chalcidoidea), with comments on the classification of the family. Oriental Insects 28: 81-96. Robinson, D.W. 1969. Woolly whitefly situation in California. Pest Control Circ. 374 (January). Yasnosh, V.A. 1976. Classification of the parasitic Hymenoptera of the family Aphelinidae (Chalcidoidea). Entomol. Rev. 55: 114–120. Viggiani, G. and M. Carver. 1988. Cales orchamoplati sp. n. (Hymenoptera: Aphelinidae) from Australia. J. Aust. Ent. Soc. 27: 43-45.